Coaching for new bowlers starts on the 4th May. We will be running two hour sessions on Saturday mornings at 10am. If you would like to try bowls with no obligation or cost then fill in the request form below. All you need is a pair of flat shoes, the club will supply the bowls. Not sure then visit our new bowler page for more information. I am interesting in attending some Bowls Coaching as part of the Play Bowls initiative. 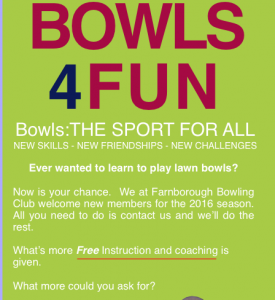 Farnborough Bowling Club is providing coaching again this season starting in the last week of April, more details to follow soon. Farnborough Bowling Club are offering coaching session for new bowlers on Saturday morning and Thursday evening from April 19th 2014. The following update has been produced by Bowls England to ensure all members are fully aware of the current position and our commitment to the provision of coaching at all levels within the sport. The Coach Bowls scheme, which is offered through the Bowls Development Alliance (BDA), is the only bowls coaching scheme that is supported by Bowls England, in association with the English Indoor Bowling Association Ltd (EIBA Ltd) and the English Short Mat Bowls Association (ESMBA). The bodies are working together to develop a suite of Accredited Qualifications and Continual Professional Development opportunities for the bowls coaching community. This is being achieved in consultation with coaches on the ground to develop a system that meets the needs of bowlers and coaches alike. The EBCS is not supported by Bowls England, EIBA Ltd or the ESMBA as the three bodies are in full support of the BDA’s Coach Bowls scheme. However Bowls England fully recognises the valuable work that members of the EBCS continue to do and the qualifications of any members of the EBCS who wish to join the Coach Bowls scheme will be recognised. When the Coach Bowls Qualifications are in place, EBCS coaches will be able to bridge their current accreditation level to the new Qualification with as simple a process as possible. The BDA Coach Bowls membership scheme provides insurance, support and benefits to all levels of coaches. By joining the BDA Coach Bowls Membership scheme you are actively supporting all of the work we do, helping to invest in the development of bowls coaching and supporting the future of the sport from grass roots to elite. via Official site of the National Governing Body for Outdoor Flat Green Bowls in England.